The new Version 2.1 of TecCMD, the solution for article, price and logistic data management between supplier and trader in the automotive aftermarket, offers its users many benefits. The complete reworking of the technology has greatly improved the operational stability and performance of the solution. Access to the solution is now via a website, which makes possible a more flexible use independently of the current workplace. In addition to German and English the solution is now also available in French and Spanish. The provision, preparation and distribution of article and price information causes a lot of work for both industry and trade. In both cases the checking and updating of this information takes up valuable resources. 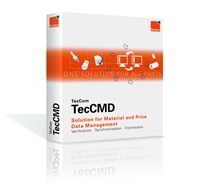 TecCMD is a market-specific solution for the standardised electronic exchange of article, price and logistic data. The solution synchronises and updates the customer’s reference data automatically or manually, and can be used internationally for different country and sales organisations. TecCMD convinces decision-makers with its extensive client system that ensures that only defined recipients can see the data. TecCMD is the business solution for article, price and logistic data management between supplier and trader in the automotive aftermarket. For the new version TecCMD 2.1 the technology of the platform has been completely revamped. A strong focus was put on the optimisation of operating stability and the performance of the solution; more than 100,000 articles can now be processed within a few minutes. The solution was moved, from the previous client-server technology with local installation of the solution on a PC, to now use a Web client. This means that the solution can be accessed from anywhere via a Website. Data security is of course guaranteed at all times. For the first time the new version of TecCMD also supports the display of customer-specific product lines and customer-specific gross prices. New report functions make possible improved controlling and a better overview of completed data updates. In order to expand the international use of TecCMD, the solution is now available in French and Spanish in addition to German and English.